Herbaceous perennial for shade to part shade. Grows to 3’ in height with a spread of the same. 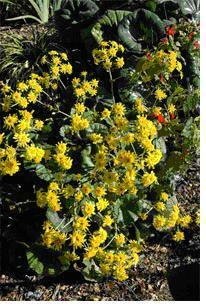 Yellow daisy-like flowers in summer on long stems above large glossy round dramatic leaves. Likes moist soil. ‘Gigantea’ is the same but larger.